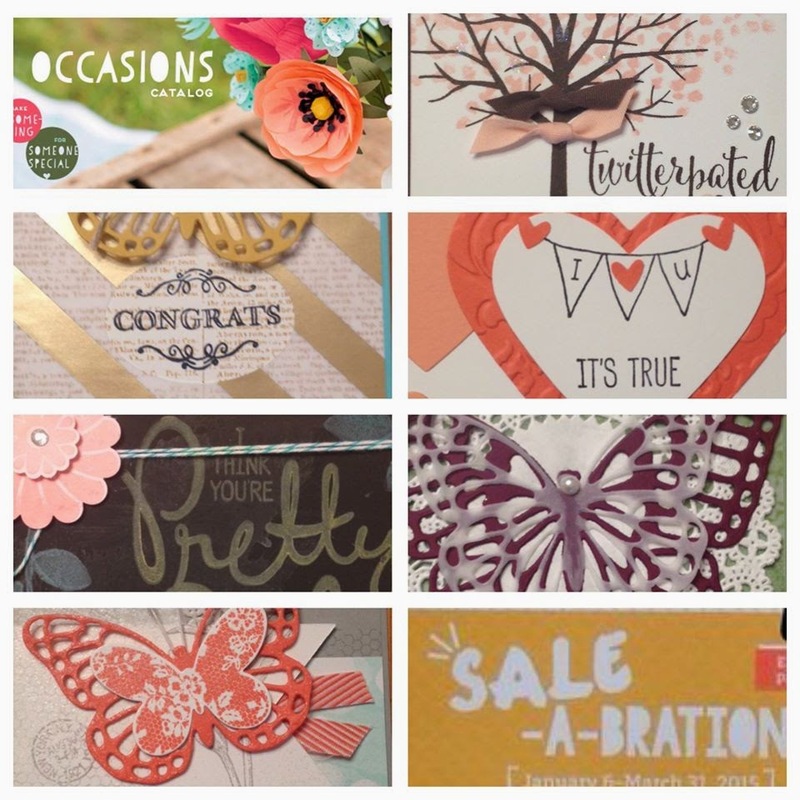 My up-line arranged a card swap featuring some of the new items from the Stampin' Up! Occasions Catalog! I'm pleased to share their cards with you for inspiration. 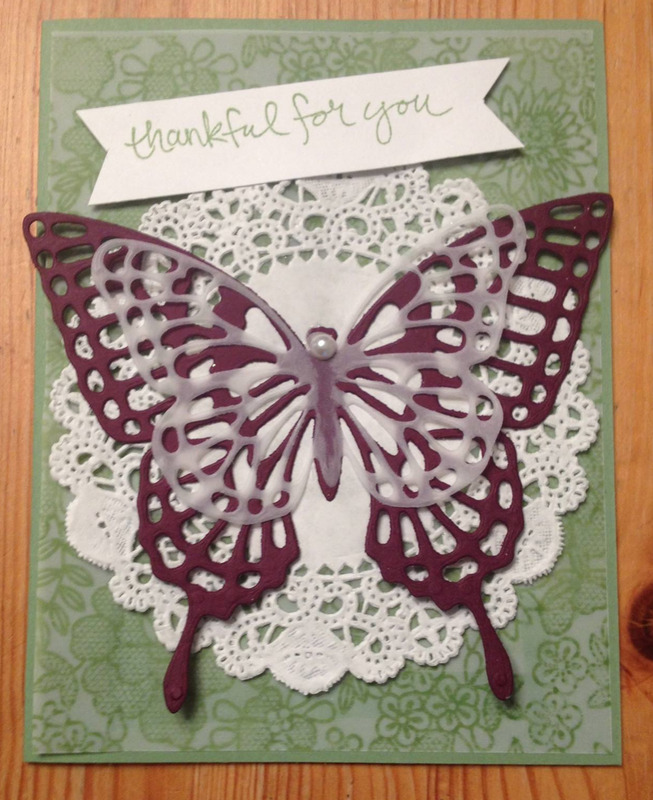 Such talented stampin' sisters!! if you'd like to pop over and say Hi to these talented ladies! scroll down to see the bottom of the post! 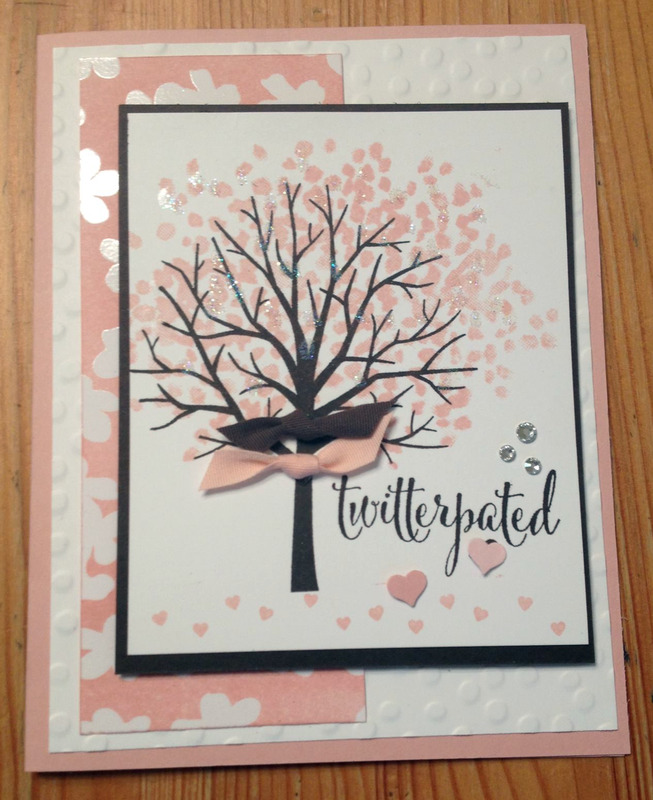 First is a card by Kim Molesworth - I'm partial to the Sheltering Tree set, it is just so pretty! 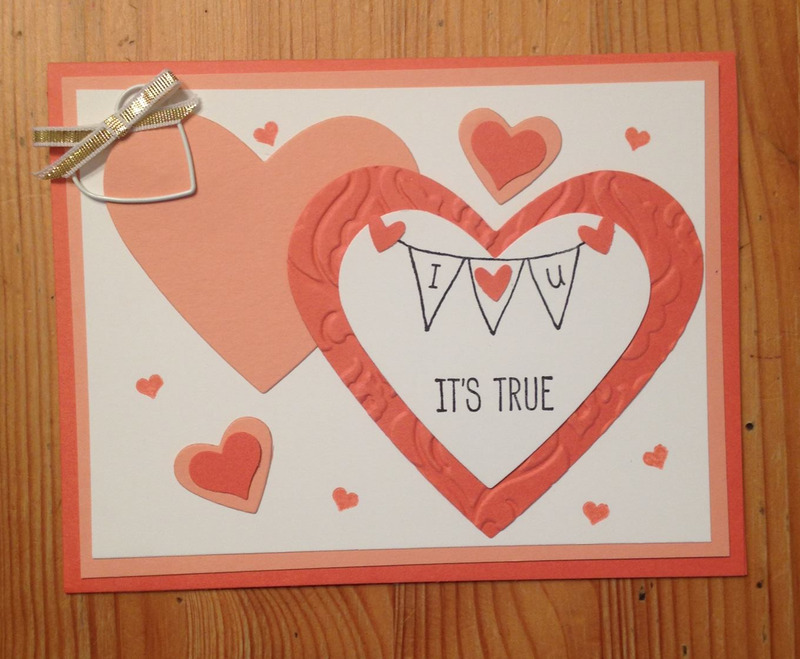 Kim used Sheltering Tree, You Plus Me stamp sets; Confetti Heart Punch; Irresistibly Yours Sale-A-Bration Designer Series paper, sponged with Blushing Bride ink; Decorative Dots Embossing Folder; Cotton Ribbon; and Rhinestones. Next, Cary Farrugia shares the beautiful Butterfly Thinlits Die - destined to be a fantastic success, so delicate! This card is CASE'd from the Sale-A-Bration Catalog and uses the Simply Wonderful Stamp set; Gold Fancy Designer Vellum Foil, Butterflies Thinlits; Stacked With Love Designer Series Paper Stack; Dictionary Word Mount background stamp; Gorgeous Grunge stamp set; Mini Metallic Clothespins, Linnen Thread, annnnnd Stacked With Love Designer Washi Tape. Karen Flores brought the Hearts Collection Framelits; One Tag Fits All stamp set; Itty Bitty Accents heart punch; Gold 1/8" Ribbon; Beautifully Baroque Textured Embossing Folder; Confetti Hearts punch; and Basic Hodgepodge Clips. 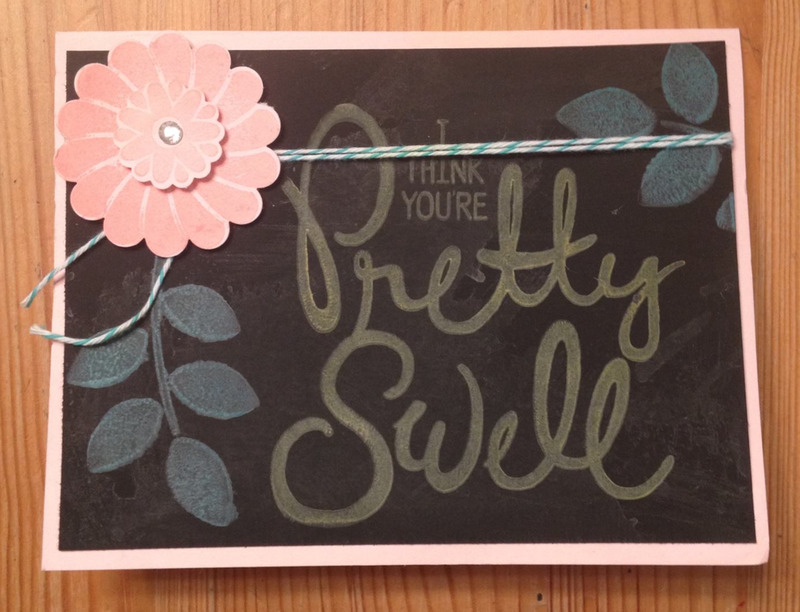 Margaret Van Vliet shared the really neat new Chalkboard Paper and Color Box Chalk Ink, Big On You stamp set; Flower Patch stamp set and Flower Fair Framelits. 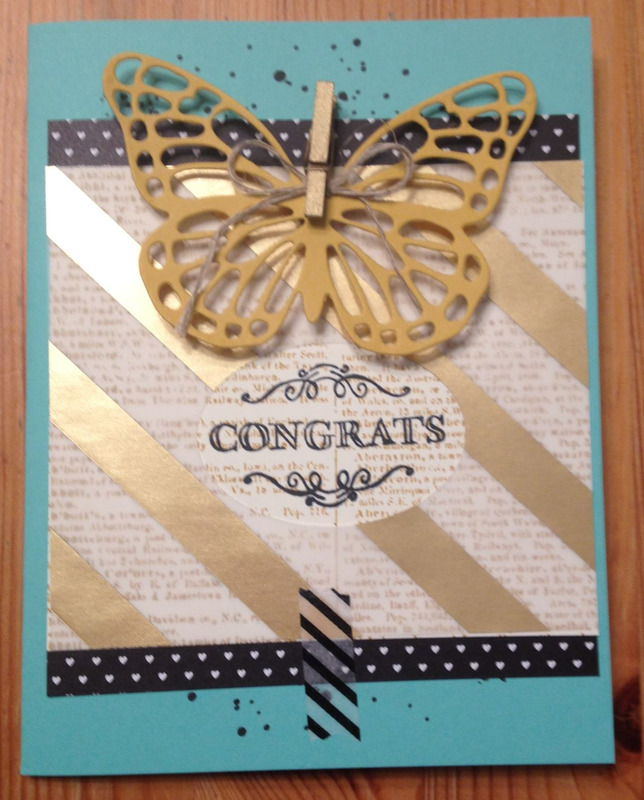 Last, but definitely not least, Lorraine Toll shared a shimmery butterfly card. 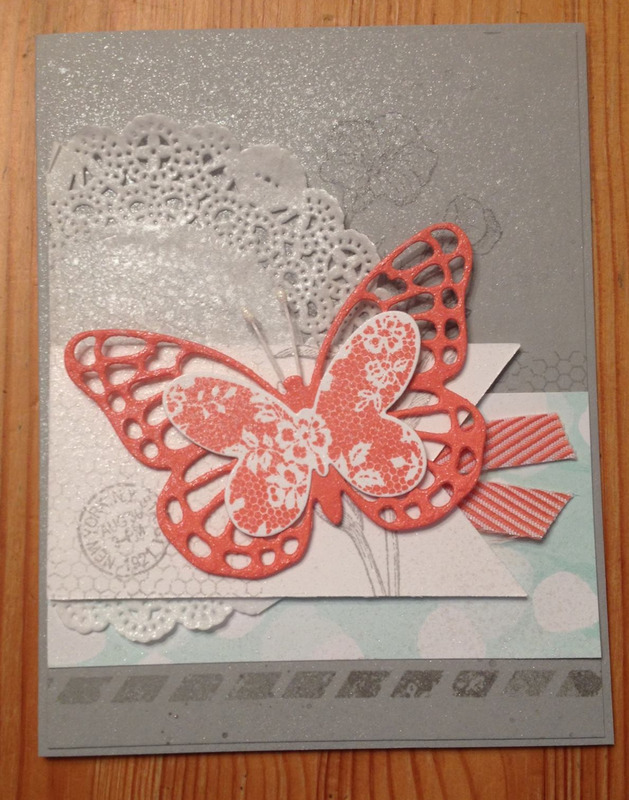 She used Basic Butterflies stamp set; Gorgeous Grunge stamp set; Doilies; Calypso Coral Chevron Ribbon; Butterflies Thinlits; Banner Thinlits; and Vanilla Shimmer Spritz. Really lovely with that pop of color!